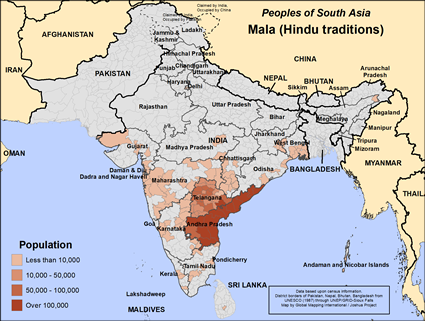 The Mala are also known as Adi-Andhra. They can be found in Andhra Pradesh, Tamil Nadu, Pondicherry and Karnataka. They speak the Telugu language along with the regional languages and write in the Devanagari script. The Mala have various sub-groups such as Charu, Reddi, Parayan, and Bandari. Their staple cereals are rice and finger millets or Ragi. They smoke an indigenous cheroot or Chutta. Both men and women habitually drink toddy and arrak. The traditional occupation of the Mala is agricultural labour in the fields of land owning communities, and cotton weaving. They make crude drums out of cattle hides and are customarily employed to play on these drums during village festivals. They work as shopkeepers and vegetable vendors and some work in cotton and oil mills. Some are employed in various government offices as teachers, doctors, administrators, engineers and in defense services. The dead are buried in a sitting posture. They worship family deities such as Yellamma and ancestral spirits. Urkondi Irrana in Andhra Pradesh is their sacred centre. The Mala Dassari or Mala Jangam is a specialist who looks into sacred matters. Their services are always sought for funerals. They sing songs known as Pogatha in praise of the departed soul. They also sing devotional songs. They participate in cultural activities during Ambedkar Jayanthi. Alternate names: Mala Asadhi, Dasari, Jangam, Kuravan, Masti, Panickar, Arayan. * For the salvation of the Mala people and that God may send several Christian workers among them and meet their spiritual and physical needs. * That God may deliver Mala people from the smoking cheroot and drinking toddy and arrak.View Mala (Hindu traditions) in all countries.